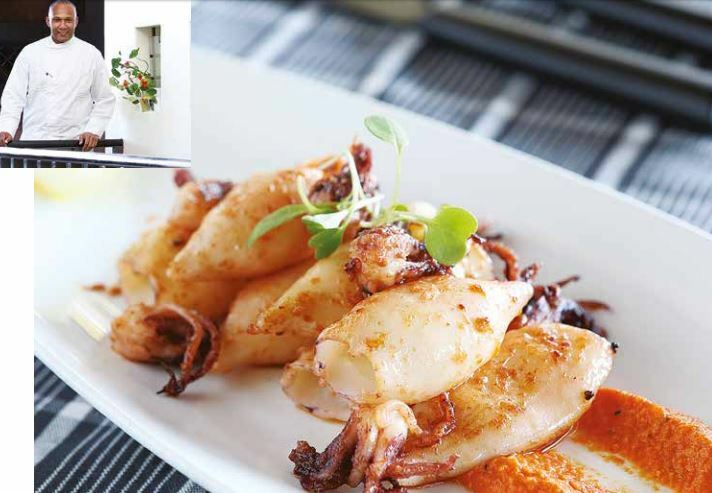 Read here the grilled Calamari with Romesco sauce recipe by Chef Coco Reinarhz. Sauté bread crumbs in oil with almonds until golden brown then add garlic. In a processor add tomato, roast peppers, paprika and lemon juice, puree till smooth. Mix this with the bread crumb mixture and cook on the stove top for about 10 minutes. Allow to cool then keep in the fridge. In a lightly oiled pan, quickly fry the Calamari and add salt and pepper. Put a table spoon of Romesco sauce on a in the middle of the plate and add the calamari.